Internet in today's world has become a basic commodity. We require Internet almost 24 x 7 for anything and everything. But once it is down, we are struck, and at times have nothing to do. 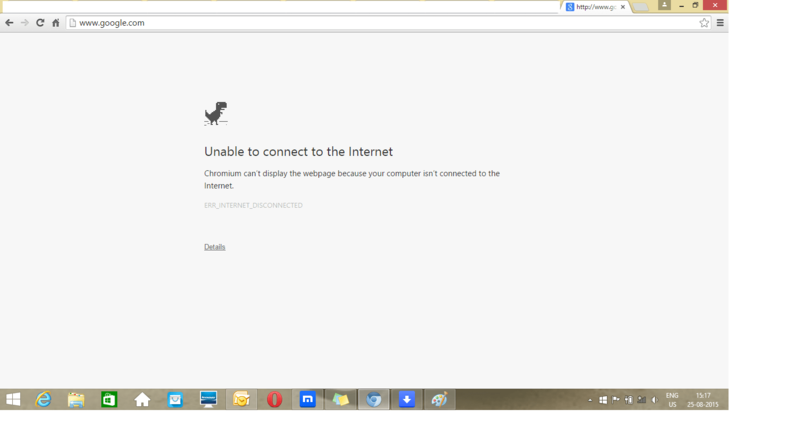 But not now, Google Chrome allows you to play Dragon game for Free, when your Internet is down. When your Internet is down, open Google Chrome browser. Every time you press the spacebar it would jump. Automatically it would run on front and many obstacles like Trees and birds would come on the way. You just need to jump over them without touching them. Play this addictive Game till the internet connection is resumed. Once the internet is live, automatically this game would end and would take you to any webpage which earlier you wish to open when the net was down.